Many industries are contending with shortages of experts in scientific, technical, engineering, and math (STEM) specialties. Rather than revisit the well-known efforts of companies to recruit STEM talent, APQC turned the problem on its ear and asked: How can organizations leverage the experts they have while, at the same time, accelerating the rate of learning for new hires and mid-career employees? Initially we focused our research through the lens of knowledge management (KM), thinking about the role of communities and networks, content platforms, expertise locators, and collaboration tools in leveraging current experts. However, our interviews quickly revealed that these KM approaches were being combined with a host of others—everything from structural approaches (e.g., consolidating senior experts in a regional or global center of excellence) to HR-driven technical talent management and training and development programs. 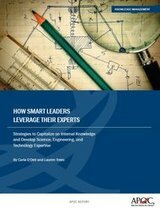 Where are the expertise gaps faced by scientific, technical, and engineering organizations? What is driving the urgency to close these gaps? How are organizations leveraging the experts they have to close the knowledge gap between experts and mid-career employees? How does this differ from the approaches used to build the competency of novices and newcomers? Click here to view an infographic on the Top 3 Factors Driving the Need for STEM Talent Development.